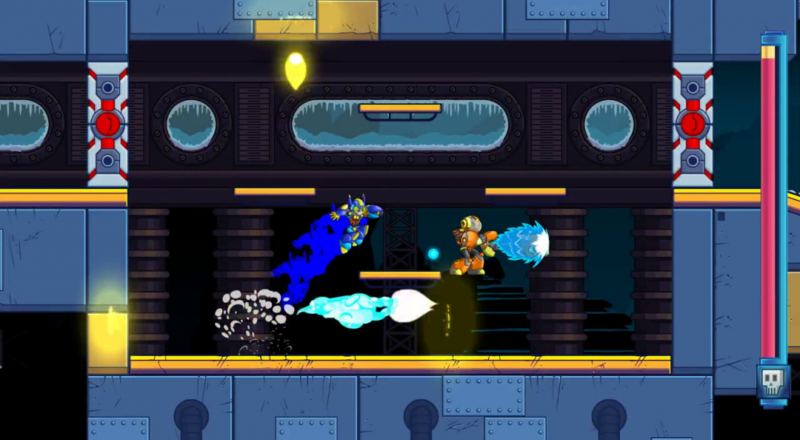 Last year, Batterystaple Games brought their vision of a "modern Mega Man X" game to life with 20XX on the PC. Today, that vision is getting some new life as it makes its way onto the PlayStation 4 and Nintendo Switch, and tomorrow on the Xbox One. The title features two player couch or online co-op throughout the main game mode, with each player controlling one of the two initial characters: Nina and Ace. Both characters have their own unique movesets and weapons, and additional characters can be unlocked by completing certain objectives in the game. The console versions of 20XX will also include two characters that were released as DLC on the PC, Hawk and Draco. 20XX differs from its inspiration by utilizing procedural generation to create its levels and incorporating rogue-like elements. Essentially, you only have one life to complete all the stages and beat the bosses. There will be some upgrades you earn along the way, but there only apply to that run. If you die, you'll lose all of those augments and go back to HQ. Fortunately, you can spend some special currency (Soul Chips) to unlock new upgrades that will become available in future runs, and even purchase a few to start off your next attempt. 20XX is available on PC via Steam, and is out now on PlayStation 4 and the Nintendo Switch through their respective digital stores. It will be available tomorrow on the Xbox One. Two player couch co-op or two player online co-op is supported. Page created in 1.5400 seconds.